CALSPEC spectrum of LDS 749B (purple) overplotted with the GALEX spectrum as small black squares and as large black squares in 50 Å bins. The large black diamonds are the λeff = 1539 and 2316 Å GALEX broad-band photometry that is within 10% of the spectral measures. In the lower panel, the ratio of CALSPEC/GALEX is shown as black circles surrounded by large black diamonds. The GALEX plus CALSPEC statistical uncertainties combined in quadrature appear as small black diamonds connected by a dashed line with a scale in percent indicated on the right axis. 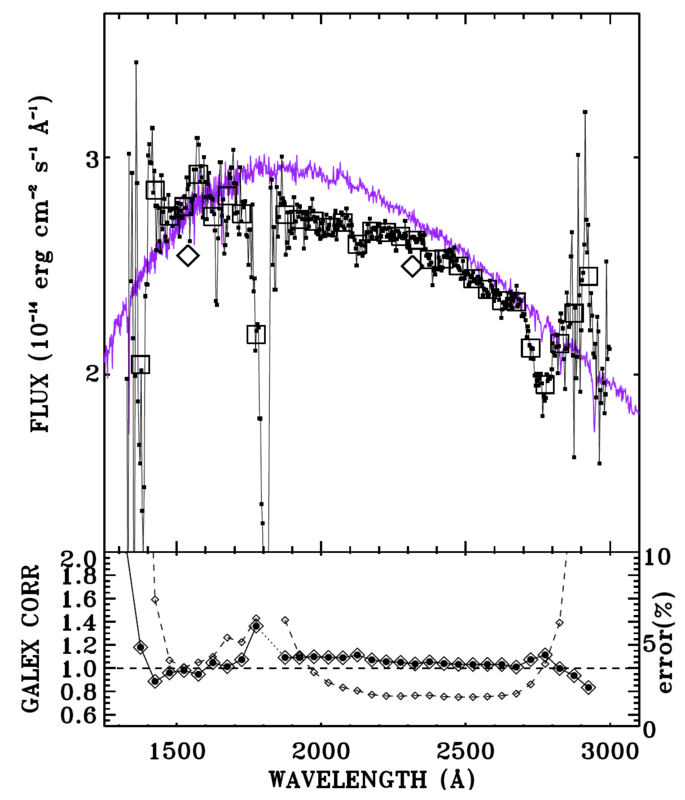 GALEX-FLUXCAL is a collection of 18 IUE spectral energy distributions (SEDs) on the CALSPEC scale that provide a correction to GALEX spectral fluxes. This HLSP also includes the correction in 50 Å bins from 1300 - 3000 Å. While GALEX spectrophotometry is repeatable to only 10-20% in regions of good sensitivity, the average flux correction presented here has a precision of ~3%. You can refer to the full collection of IGM-GAL data products using the DOI http://dx.doi.org/10.17909/T9DX2D You can retrieve the set of IUE data used in this HLSP using the DOI http://dx.doi.org/10.17909/T9FQ2N. WAVELENGTH - Wavelength in vacuum in Angstroms. NET - The averaged net signal in linearized IUE Flux Number (FN) units per second. FLUX - The average flux in ergs cm-2 s-1 Angstrom-1. BKG - The background signal (same units as NET column). UNCERTAINTY - The formal, propagated uncertainty as the "error-in-the-mean" (same units as FLUX column). NPTS - The number of observations averaged. TIME - The total exposure time in seconds. RMS - The RMS scatter among the observations as a percent. There are two slight differences in the column labels between the FITS and TXT files, e.g., "NET" in the FITS versions and "NET/time" in the TXT versions, and "RMS" in the FITS versions and "RMS(%)" in the TXT versions, but both the FITS and TXT columns have the same definition and values. The FITS primary headers also contain a list of all the IUE observation IDs that went into the SED coadd, stored as DATA<nnn> keywords, e.g., DATA001, DATA002, etc. In addition to the SEDs, a table is provided that has the GALEX-to-CALSPEC flux ratios in different wavelength bins. GALEX spectra should be multiplied by the average corrections in this table to place them on the HST/CALSPEC scale. The text table can be interpolated to define the GALEX correction at intermediate wavelengths.